Usually sleepers pass through five stages: 1, 2, 3, 4 and REM (rapid eye movement) sleep. These stages progress cyclically from 1 through REM then begin again with stage 1. A complete sleep cycle takes an average of 90 to 110 minutes. The first sleep cycles each night have relatively short REM sleeps and long periods of deep sleep but later in the night, REM periods lengthen and deep sleep time decreases. Is light sleep where you drift in and out of sleep and can be awakened easily. In this stage, the eyes move slowly and muscle activity slows. During this stage, many people experience sudden muscle contractions preceded by a sensation of falling. Eye movement stops and brain waves become slower with only an occasional burst of rapid brain waves. Extremely slow brain waves called delta waves are interspersed with smaller, faster waves. The brain produces delta waves almost exclusively. Stages 3 and 4 are referred to as deep sleep or delta sleep, and it is very difficult to wake someone from them. In deep sleep, there is no eye movement or muscle activity. This is when some children experience bedwetting, sleepwalking or night terrors. Slow wave sleep comes mostly in the first half of the night, REM in the second half. Waking may occur after REM. If the waking period is long enough, the person may remember it the next morning. Short awakenings may disappear with amnesia. What happens in the REM period? In the REM period, breathing becomes more rapid, irregular and shallow, eyes jerk rapidly and limb muscles are temporarily paralyzed. Brain waves during this stage increase to levels experienced when a person is awake. Also, heart rate increases, blood pressure rises, males develop erections and the body loses some of the ability to regulate its temperature. This is the time when most dreams occur, and, if awoken during REM sleep, a person can remember the dreams. Most people experience three to five intervals of REM sleep each night. Infants spend almost 50% of their time in REM sleep. 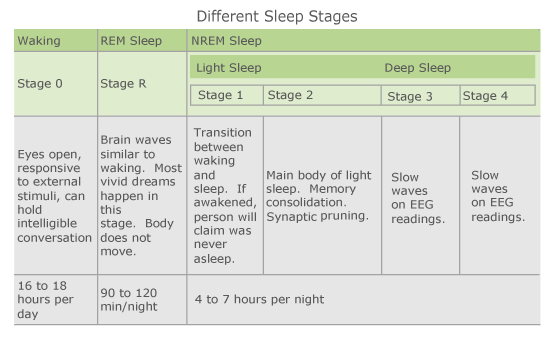 Adults spend nearly half of sleep time in stage 2, about 20% in REM and the other 30% is divided between the other three stages. Older adults spend progressively less time in REM sleep. The brain waveform during REM has low amplitudes and high frequencies, just like the waking state. Early researchers actually called it "paradoxical sleep". What are REM and non-REM sleep? A lot happens in your body while you sleep. When you get your sleep, you cycle between REM and non-REM sleep. REM stands for rapid eye movement. During REM sleep, your eyes move quickly in different directions. That doesn't happen during non-REM sleep. First comes non-REM sleep, followed by a shorter period of REM sleep, and then the cycle starts over again. Dreams typically happen during REM sleep. There are three phases of non-REM sleep. Each stage can last from 5 to 15 minutes. You go through all three phases before reaching REM sleep. Stage 1: Your eyes are closed, but it's easy to wake you up. This phase may last for 5 to 10 minutes. Stages 3: This is the deep sleep stage. It's harder to rouse you during this stage, and if someone woke you up, you would feel disoriented for a few minutes. During the deep stages of REM sleep, the body repairs and regrows tissues, builds bone and muscle, and strengthens the immune system. As you get older, you sleep more lightly and get less deep sleep. Aging is also linked to shorter time spans of sleep, although studies show you still need as much sleep as when you were younger. REM sleep happens 90 minutes after you fall asleep. The first period of REM typically lasts 10 minutes. Each of your later REM stages gets longer, and the final one may last up to an hour. Your heart rate and breathing quickens. You can have intense dreams during REM sleep, since your brain is more active. Babies can spend up to 50% of their sleep in the REM stage, compared to only about 20% for adults.